It was the car that was to be MG Rover’s last stand. 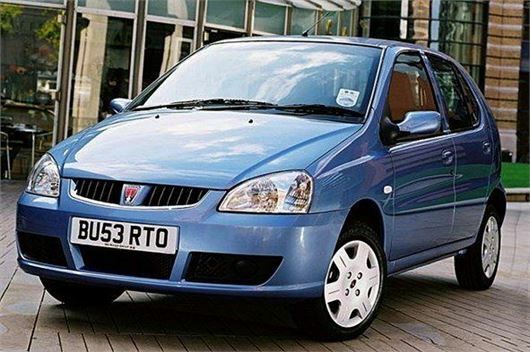 A model that was rushed into the company’s portfolio as a last, desperate attempt to kerb falling sales, as well as to plug a yawning gap in the Rover range that had been void since the demise of the Metro-based 100 in 1998. Based on the Indian Tata Indica, and built in India before being ‘Roverised’ at Longbridge, the CityRover was hailed as the company’s ‘New Metro’, but any expectations that it could compete on a level playing field with the likes of the Ford Fiesta and Vauxhall Corsa were soon stymied by the car’s execution. The CityRover was cheap, but there was a very good reason for that. Depending on trim level, it looked quite smart, and its 1.4-litre petrol engine, derived from the Peugeot-Citroen TU powerplant, was pretty lively. But that’s pretty much where the compliments started and ended, because the quality was dreadful. The Indica on which it was based was a car built for developing markets, which was all very well, but for European buyers accustomed to tight-fitting trim and high-quality, soft-touch plastics, the CityRover fell at the first hurdle, with even the first batch of press cars suffering from bits of trim falling off. MG Rover, sadly, didn’t have the money in its coffers to spend on improving the quality of the cars it imported. The powertrain, also, wasn’t suited to the UK market. Sure, the 83bhp 1.4-litre engine was peppy, but it also suffered from high exhaust emissions, making it more expensive to tax than most small cars. Plus, if you drove it on the motorway, it would struggle to top 35mpg, where most of its rivals were achieving 50mpg. But was the CityRover really that awful? In many ways, no. It was cheap to buy, with the entry-level ‘Solo’ model coming in at just £5495 at launch. If you went for the range-topping Style model, the equipment level was even quite generous - remote locking, electric rear windows and leather (well, sort of…) trim were all thrown into the mix to entice buyers. It was enough to get some of the brand’s traditional buyers into showrooms - indeed, Rover managed to shift just under 10,000 CityRovers in two-and-a-half years, such was the loyalty of its patriotic following, many of whom had no idea about the car’s Indian origins. Most of them liked it. Add into the mix decent mechanical durability, and the CityRover would actually be quite a loyal companion. Yes, the interior light would fall on your head if you closed the door too hard, and the dashboard had more rattles than a kindergarten, but in terms of reliability, the little Rover was actually much better behaved than many supposedly better cars. They’re also quite good fun to chuck around - the chassis set-up is basic but competent, and while the CityRover is prone to understeer if pedalled too hard, it’s a very predictable and quite entertaining little thing to drive. As a new car, it didn’t make a lot of sense, and as a used car even less so, as depreciation levels were staggering. But today, with the remaining CityRovers well and truly in the bargain basement, there’s a certain novelty to them. If you don’t believe us, find a couple of hundred quid and try one, you might even like it. So, does this mean the last new car to be launched by Rover has the potential to become a bona fide classic? Well, in terms of brilliance and desirability, categorically not. It wasn’t ever a great car, and it’s unlikely to be remembered as such. But with fewer than 1000 CityRovers left on Britain’s roads, it’s already becoming something of a rarity, especially when you consider that the vast majority of those are simply disposable cheap cars that are one major failure away from the scrapyard - even a set of tyres is enough to write one off. A handful need to be saved for posterity, as the CityRover’s sad place as a footnote in the MG Rover story gives it a level of historical importance. Discuss. A Rover engineer once told me it was the worst car he had ever driven. The later post-receivership black facia models are better but Rover senior management ignored what its engineers were telling them about what could and needed to be done - it might not have cost much since as a relatively new manufacturer Tata wanted to improve its products to a global standard. The body design was by Guigaro and is not dissimilar to the South American Fiat Palio. Rover also screwed up by selling it for too high a price. With a bit of development and a K series engine it could have been a good car and delivered Rover into Tata ownership along with JLR. It's also commonly thought that Rover overstretched the brand and should have badged it as an Austin. It seems even more ironic that the Phoenix team abandoned the CityRover and looked seriously at reintroducing the Metro based 100. Classic? Classic example of trying to flog a 70's quality car to the unsuspecting public. Put one in the foyer of every business school in the country as a warning to what happens when the bean counters are left to run the company. Future classic? You're having a laugh! Those City Rovers were appalling cars- a final blot on the honourable name of the Rover marque. Putting in a K series engine would not have made it a better car, the K series was one of the things that blighted Rover. Warranty claims were terrible and customers were getting sick of having their cars being recovered by a flat bed truck. Apart from anything, when I worked at a rover dealer, people were coming back days after buying CityRovers trying to get their money back. I actually seen two grown men crying and begging the sales manager. The dealerships didn’t want them back so offered not much more than half the original price to take back a car. It was pitiful. I haven’t driven a new car as bad as a CityRover other than a Lada Riva, they drove like a poor imitation of an early eighties Micra. It may have been on Top Gear but there was a 'Top of the range' model which featured a pearlescent paint job and cost a bomb. For nearly the same price you could pick up a nearly new Focus. I've found two for sale under 1k on Autotrader - anyone feeling lucky?